A few months back, I promised a review of Adam Schwartz's "Reinstating the Hoplite: Arms, Armour and Phalanx Fighting in Archaic and Classical Greece". In this post I am going to specifically address Section 3.4, Othismos. I’ll restate that this book is a remarkable resource. If you own only one book on hoplite combat, own this one. Much of the book is a filtering and restatement of arguments put forth in a series of papers that make up the great “Heresy-v-Orthodoxy” debate, meticulously footnoted. If you have read all of these papers, then much of this book will not seem novel, but it is nice to have all of this in one place and Schwartz’s commentary is often quite insightful. His description of othismos is a weakness of the book. The hoplites in the front stemmed their left shoulder against their shield and thrust it against the shields and bodies of the enemy with all their might; and the ranks behind them in turn stemmed their shields against the backs and right side of the man in front in a ¾ stance, as it were. In this way, a tremendous pressure could be generated and conveyed through the entire phalanx from the rearmost rank, its force increasing on the way. Right away, Schwartz has unwittingly presented us in these two sentences with contradictory mechanics. This is the most glaring problem with the current portrayal of othismos, and the focus of my campaign to correct our understanding. You cannot both stand at a “¾ stance” and sustain “tremendous pressure”. A ¾ stance is one in which your body is held at a diagonal behind the shield, which is facing flush to your foes. The arm is bent, with the arm and body forming an acute angle. This is the natural stance for just about all combat sports, from Asian martial arts to renaissance fencing. Hoplites probably stood this way when engaged in spear fencing. 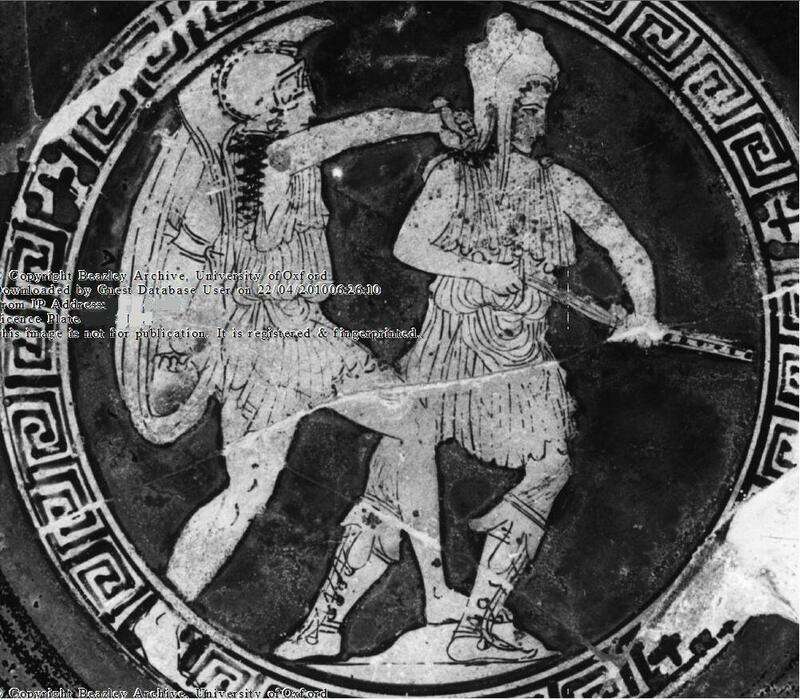 I will do a full post on stances and weapons grips used in hoplite combat at a later date, but for now it is important to understand that in this pose, the only thing holding the shield away from the front of your body is the strength of your arm and shoulder. Were I to grab you by the right shoulder with one hand and the shield with the other and try to force your shield to touch your chest, it is easy to see that very little of your musculature resists my pushing. Now, even the biggest weight lifter cannot resist “tremendous pressure” with the strength of his arm and shoulder alone. Remember that less than 10 men can generate 1,000 lbs of force or more. 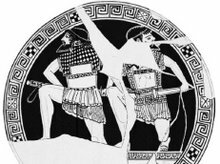 So if we take the description of men at ¾ and apply anything approaching the force that can be generated by files of hoplites, the end result will be that the hoplites collapse into the bowl of their shields, chest to underside of the shield rim. Once they collapse into the shield in this way, they occupy less space than they did in the ¾ stance. Thus, as the file closes in there is no room to move back into ¾ stance again unless the files spreads out. This is important because the current orthodoxy posits a stance with the left shoulder inside the bowl of the shield, pushing on the inner shield-face. Many have interpreted Arrian, the Roman tactician, describing this in a section of his Tactica (16.13). Arrian of course was not a hoplite and the passage in question does not exist in earlier sources for his tactia. He did on the other hand live at a time when Romans formed shield-walls, later called a fulcum, wherein men with very different, single gripped, shields may well have pushed standing sideways at far lower pressure than a hoplite with an aspis could survive. If we toss out the ¾ stance when pushing, then we can also eliminate the notion that the depth of the aspis was to allow the shield to be rested on the shoulder while pushing. I won’t go on here, but look back to my previous posts to learn how hoplites stood with their shields and a further examination of why the “shoulder rest” function was a side benefit and not the purpose for the depth. At 3.4.2, the book moves on to describe arguments for and against a literal othismos defined as above. This section is a good distillation of the various viewpoints, but in rebutting the opinions against othismos, Schwartz goes awry. He specifically addresses two arguments: 1) the tremendous force generated by deep files of men would cause a squeeze that would be “distressing to contemplate” in Fraser’s words (1942), and 2) the great pressure would impede weapons usage. The mass pressure was not achieved by the weight of the warriors, but by their muscles…the mass of the hoplites played a relatively minor role. It came into play chiefly when brief, thrusting impulses were transmitted from one warrior to another. Schwartz focuses on this and tells us that it “corrects a common enough oversight in the othismos debate.” In fact, Franz, via Schwartz, is propagating a misunderstanding of crowd forces while at the same time being represented as an authority on the subject. Mass is the most important factor in transmitting forces through dense crowds. It is through “leaning” and resting your weight on the man in front, more than “pushing with the legs” that force adds cumulatively in crowds. Members of crowds stand for the most part upright and lean into each other with the upper body angled to some degree. The amount of pressure that can be generated in pushing with the legs is restricted by the angle the legs make with the ground- the closer to perpendicular the less pressure you can generate, with an optimal angle at something acute like 45 degrees depending on how well your feet grip the substrate. This is important because, as we have seen in crowd data that I presented previously, high pressures within crowds can be maintained for long periods of time. It is in fact the duration of pressure even more than the sheer amount that causes asphyxia in crowds. So, contra Schwartz, the pressure in ranks of hoplites would be “impossible to resisist” without an aspis to protect the diaphragm. His mention of armor as protection against asphyxia, even if true (some reenactors of ECW push of pike battles tell me that the breast and back does help) becomes problematic when we consider the rise in the era of deepest ranks of the organic corslet, sometimes called “tube and yoke” or linothorax. When people behind sense that the pushing does not bring about any immediate advantage, they stop pushing. The result is a kind of reverse thrust. This statement shows a fundamental difference in a “crowd” of pedestrians and a “crowd” of hoplites in othismos. The hoplites want to generate lethal levels of forces, while crowds do so only accidentally. If we start from the definition of othismos presented at the beginning of this post, then the goal of opposing ranks is to produce the maximum pushing force that they can. What he describes is true for pedestrian crowds, and this behavior is also why we don’t see othismos in every other battle-line in history. Once the front of the file gets squeezed to their limit, they push back on their own men, causing the file to open. In hoplites this did not happen until the pressure became enormous because of their ability to withstand being squeezed without suffocating. An analogy to what happens between men in Franz’s depiction would be you walking down a hall and pushing against a closed door. If the door does not open, you stop pushing, the feedback telling you it is locked. But if you know the door is locked and your goal is to break down the door, then you do not stop pushing even when the same exact feedback tells you it is locked. You push harder in order to bust it opened. This is what hoplites did. Their “crowds” were meant to push against resistance and overcome it. Schwartz touches upon this in mentioning crowd disasters, but does not connect the crowd of hoplites to the type of crowd that ends in deaths from asphyxia because he cannot describe why hoplites could survive this. My own examination of the aspis’s role in protecting against crushing of the diaphragm can. 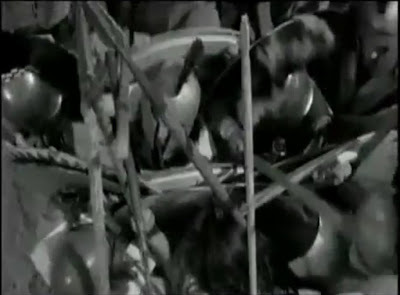 There is no reason to expect a group of motivated pushing hoplites to be “like any other crowd moving in a particular direction.” They are intentionally attempting to generate the maximum sustained force against their opponents, and could generate sustainable forces far in excess of those which occur accidentally in crowds of similar size. A bit further on, he discusses that othismos could not last long. This has been an objection of many: “How can you push for an extended period?” The answer again comes from an understanding of crowds. Pressure can be maintained within crowds at rock concerts for long periods. Force will vary over time, but not in the quick oscillations Schwartz envisions. There could be "lulls", the force reducing as men simply unpack to catch their breath, perhaps even pulling completely apart and engaging at spear range again. At the end of this section, following the prevalent notion of hoplites charging directly into othismos, he brings up the fact that many units charge, even when occupying positions of superior height. He portrays them as abandoning tactical advantage for momentum. I won’t dwell on this, but Polybios specifically describes the problem with not charging downhill during the battle of Sellasia (2.68), and it has nothing to do with momentum for othismos. The second objection he addresses is that weapons cannot be used in othismos. He quotes Cawkwell’s statement that men would “better be able to use their teeth than their weapons”. I’ve addressed this at length, and I was glad to see that Schwartz also saw the utility of the short sword in the press of othismos. He correctly sees the limitations of the spear in othismos and presents the overhand grip as the exclusive strike for use within the phalanx as well. I’ll delve into that deeper in a future post. He also does a great job of showing the folly of van Wees’s notion that the aspis cannot be used to push because it was held up at a slant and only the bottom rims would collide. Obviously, the men would simply collapse into their shields as they push and Schwartz points this out. Unfortunately, he did not see that this same logic applies to men standing at ¾ stances as I described above. He also twists Xenophon (Cyr. 7.1.33) to mean that the aspis was rested on, not against, the shoulder. The clear reading of the passage is that the shield was rested against the shoulder/upper arm, and this can certainly be read as a description of the way I portray hoplites as resting the rim against the front of the shoulder, on the broad shoulder piece of the organic corslet. Note that some depictions show these stiff shoulder pieces extending wider than the shoulder, so if you push with the shield on the shoulder the stiff pad gets jammed into your neck! Section 3.4.3 is an examination of the morale effects of added ranks, which are in no way incompatible with othismos, but works alongside it. In 3.4.4, he discusses the need to maintain cohesion. Goldsworthy’s notion of depth as a means of maintaining cohesion in the presence of broken terrain is mentioned, but as I have shown previously, there is no record of 25 or 50 rank phalanxes deploying from this depth into a shallower, broader line. Unless these men are meant to stand idle until the front ranks somehow break through, getting more men into the area is not helpful unless they can move to a shallower formation and engage the enemy. He describes the Argive predilection to run too early into the charge and notes that this tore holes in the formation between them an adjacent units. Interestingly, he goes on to describe Spartans foregoing the charge, but does not seem to realize that this too must result in gaps between them and adjacent units that did have a running charge. The whole line cannot have arrived simultaneously against the enemy line if part walked and part ran. This has been overlooked by everyone to my knowledge. 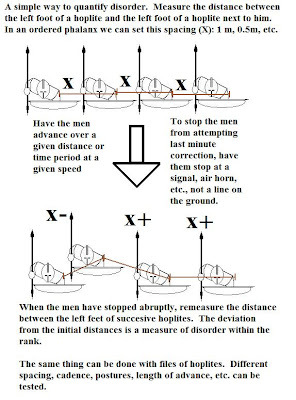 Following the common model of othismos, he mentions hoplites charging 50 m (later 20-25m) in order to impart “a maximum of penetration power at the collision”. The real cause of the charge has more to do with the “tremendous nervous pressure” he also describes, because it takes only a few yards to achieve the “ramming speed” suggested by the orthodoxy. 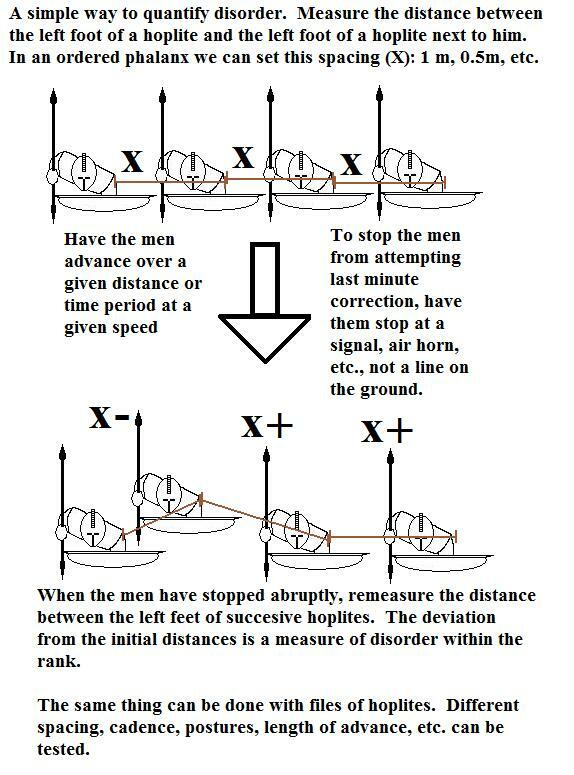 Any distance in excess of that simply causes fatigue and a loss of cohesion for no gain of momentum. In fact, the whole notion of a charge like an un-horsed medieval knight imparting maximum pressure is a fallacy, as I have previously demonstrated. Dense packing is far more important for a strong and sustainable force even if it occurs at slow speed. 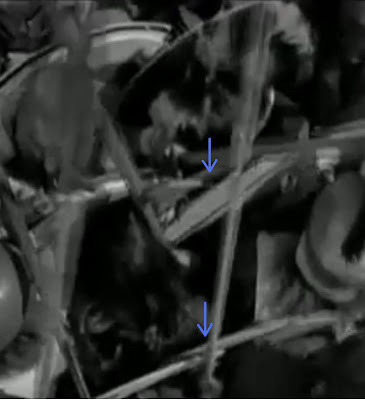 It is in the final section, 3.4.5, that Schwartz’s portrait of othismos falls apart. He again draws on “observations of crowd behavior” to portray othismos as a “phenomenon occurring at intervals”. He applies what I is think a wildly inappropriate reference on Spartan leaders having trouble keeping the rear ranks from pushing forward to initiate the charge to show that rear ranks could push forward when locked in combat. I do believe that they did push forward within the file, but this reference cannot be applied. Cavalry were famous for “chomping at the bit” to rush into the charge as well, but there is not corresponding push when engaged in combat. Using an innapropriate reference gives ammo to the foes of othismos. Inexplicably, he abandons the ¾ stance, where men push their shields into the back of those in front, for Luginbill’s “T” shaped, side-on stance where men push into the side and right shoulder of those in front. Then he has the file leaders being propelled into the enemy ranks by the file behind them “killing left and right”. Far more likely is getting “killed from left and right”. More importantly, the overlapping of shields within each succesive rank make any single file pushing through the stacked ranks and out of formation, then into the enemy’s overlapped ranks, unlikely. He states that: “Such othismos may have occurred in short bursts, and at random intervals, as the rear ranks felt they might help their comrades by applying pressure. And not all 7 ranks need to participate in shoving simultaneously…” This is a radical departure from Hanson's “a common effort, ostensibly by a common push…of the entire phalanx…into the enemy in order to drive them back”. In fact, what he goes on to describe is nothing unique to hoplites. Romans and pretty much any linear formation in ranks surely had disorganized pushing by eager men behind the front ranks. This interpretation makes “othismos” so common in the history of warfare that it hardly warrants a special term in the Greek context. This commonality also goes a long way towards unraveling all of the arguments for the form of the panoply being derived from the need to be effective in the “push”. Any Roman with a scutum could do what Schwartz advocates and frequently did. Part of the problem is that Schwartz is in a bit over his head. I do not say this disparagingly. I applaud him for attempting to bring in concepts from crowd mechanics even if he ultimately does not sufficiently understand them. A statement that hoplite battles were “essentially chaotic” is ironic, because I agree with him, but my understanding of chaos is clearly far different from his own. The phrase “no one to direct the movements of the enormous organism” is so close to what I believe the truth, but we need to add an understanding of how order emerges from seemingly ‘chaotic’ interactions within groups. The study of how this occurs through what is called self-organization will ultimately yield a clearer understanding of hoplite combat. Groups of men, like flocks of birds or schools of fish, can achieve a great degree of cohesion and coordination through simple interactions between men in a bottom-up fashion, and do not require the top-down direction of generals for much of what occurs in combat. Thus, we do not need “a referee with a whistle” as Holladay (1982) said would be needed to move from one phase to another. Such “phase transitions” can arise simply from the interactions of individual hoplites in the absence of specific orders. I just received Adam Schwartz's "Reinstating the Hoplite: Arms, Armour and Phalanx Fighting in Archaic and Classical Greece". It is an excellent resource, and a good rebuttal to many of the weak points of Hans Van Wees "Greek Warfare: Myths and Realities." Unfortunately, he passes over some of Van Wees better ideas and propagates mechanics for othismos which you should recognize as flawed if you've read through my previous posts. There is not all that much new in the book, and some of the the newer elements are subject to logical flaws, but as a review it is an excellent resource if you can afford to add it to your shelf. The book is most useful to me in that he provides passages from German works that have been opaque to me until now. One of these is a book by Franz (2002) that actually discusses crowd behavior, though once again confusing the manner in which force is generated in crowds. Still, I would have cited him in my 2007 paper had I known he even broached the topic. I'll do an in-depth review of this book at some point. Perhaps comparing where I agree with him and where Van Wees and Goldsworthy are correct. The second work that has come into my possession is a paper by Chris Mathew, "When Push Comes to Shove: What was the Othismos of Hoplite Combat?" I have corresponded with Chris in the past, a hoplite reenactor and a very nice fellow. I was very pleased to see a reenactor working for his Ph.D. and looked forward to his input into the debate. Unfortunately I cannot agree with most of his views on hoplite battle. His main assertion, that hoplites fought with the dory using what I and others have termed the "high underhand" grip, is surely incorrect. As with the book above, I will try to do a full review of this paper in the near future. I think his main problem is that he was working within the paradigm of the "charge directly into othismos" crowd. The formations he describes are well suited to defeating such a charge, but taken out of that context can be shown to be quite ill suited to hoplite combat. I happened upon an image of othismos as I describe it in my crowd-othismos model: men packed tight belly to back, not pushing side-on. This is an frame from the Discovery Channel's War and Civilization that can be seen on youtube.com. Here we can see the type of packing that must occur. Yes, I know the shields are terrible. You can see that in this environment the overhand grip on the spear will provide a much broader range of motion than even a high underhand grip. You'll also see that at this range the dory is useless for fighting in the front rank against your immediate foe. There is no way to choke up on the shaft far enough to bring an 8' spear to bear on the rank ahead of you. Thus, either the first rank used swords, or fought past the men in front, aiming deeper in the enemy ranks. Another thing you can see is why I think the shields must overlap right over left, i.e: the man on the left comes up behind the overhanging shield of the man to his right. In the image below, the arrows show a weak point in the shield-wall when overlapped left over right as under the top arrow. The reason this joint gives way is that the portion of shield off to a man's left is easier to push back than the portion to the right. The flange to the left acts as a lever on the hoplites arm, while the right side, if forced back, is pushed into his body. 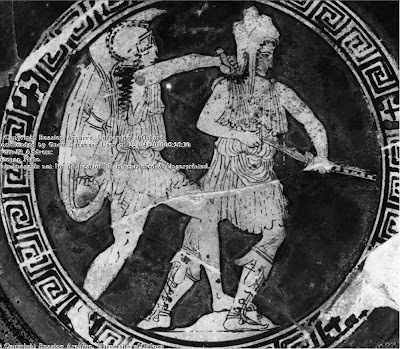 Now look at the lower arrow and you will see that pushing here only tightens the bond between shields and strengthens the wall, forcing both shields back into the body of the hoplite on the left.